The Red Bulls celebrate after their opening goal. Photo by Jason Schott. The Red Bulls beat Club Deportivo Olimpia of Honduras 2-0 on Thursday night at Red Bull Arena in the second leg of the CONCACAF Champions League Round of 16. Coupled with the 1-1 draw they played a week ago in Costa Rica, the Red Bulls won 3-1 on aggregate. 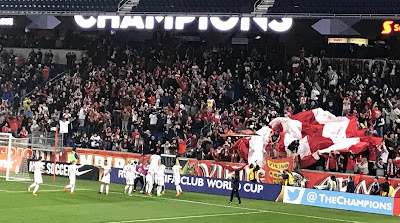 The Red Bulls are now in the Champions League quarterfinals, and will take on Club Tijuana in a two-leg series, with dates and times to be announced at a later date. The first half was marked by tight defense, with neither team getting a shot on target and the heavy rain making it hard to set up plays. The Red Bulls broke through early in the second half, when Bradley Wright-Phillips dribbled through one defender and ripped a shot from outside the 18-yard box past the goalkeeper to the near post to make it 1-0 Red Bulls. Wright-Phillips tallied his 101st career goal as a Red Bull across all competitions. It was his second career CONCACAF Champions League goal. BWP has tallied a point in his last three matches, dating back to last season, including two goals. It didn't take long for the Red Bulls to strike again, as Tyler Adams fed teammate Sean Davis atop the 18-yard box, and Davis took two dribbles to his left and sent a curling shot across his body and deflected off a defender to make it 2-0 in the 64th minute. Adams not only recorded his first career CONCACAF Champions League assist, but became the second active Red Bull to tally an assist in four different competitions. He joined Wright-Phillips as the only two current Red Bulls to record an assist in MLS regular-season, MLS playoffs, U.S. Open Cup and CONCACAF Champions League. Red Bulls goalkeeper and new captain Luis Robles tallied a game-best four saves to record his fourth career CONCACAF Champions League shutout. Midfielder Marc Rzatkowski made his first start as a Red Bull after making his first appearance just one week ago. The Red Bulls' new Young Designated Player Alejandro Romero Gamarra made his first career appearance as a Red Bull, as he came on in the 65th minute. Gamarra, also known as Kaku and hails from Argentina, came close to scoring a goal in the 84th minute, but his shot from the top left of the crease missed curling inside the right post by inches. Olimpia had plenty of chances in the second half, as they got four shots on target. Their best chance came in the 55th minute, right after Wright-Phillips' goal, when Carlo Costly got a shot in on Robles, who couldn't corral the wet ball, which went back to Costly, and it slipped off the top of his shoe before he could get another shot off. Red Bulls Head Coach Jesse Marsch said of the win, "Overall, I thought we managed things very well. This early in the year, to be tested like that is great. I think that we have a group that's ready for moments like this, that's fearless, that's ready for big challenges early on, so it's fun and exciting. "And we also got a few guys in the game, Gamarra and (Carlos) Rivas, and get them going. We think that those guys are going to be a big help this year, so we need to continue to integrate them, get them fit, and make them part of our group. Overall, very good night." Marsch said of Adams, who had an assist on their second goal, "Tyler's next steps are in the middle of the field and can really establish himself as a big time player there. For me, the two guys in this series, I thought Luis (Robles) was really good, and then I thought both Tyler and Aaron Long were very good in this series, so I think Tyler's gonna keep showing his quality as the year goes on and get better and better." The attendance was 11,677, most of which were Olimpia fans, and they made their presence known throughout the night. Their fans appreciated that they got to see them here, especially in a tournament that means a lot to Latin American soccer fans. Club Deportivo fans at Red Bull Arena. Photo by Jason Schott.